In a sense, all photographs are ‘viewfinders.’ The window is also a ‘finder of a view,’ whether from within or without; as such, it acts as a surrogate for the camera lens and the process of photography. William Fox, a curator and poet, has described the “cognitive dissonance in isotropic places” we encounter in deserts. The human sensory system struggles to process the landscapes in the deserts of the American West, what seems neverending sameness in all directions. We simply cannot make sense of what seems a lack of information. Our brain stalls in its processing job. We fall back in awe of both the desert beauty before us, and something more that remains hidden from us. Our visual perception of the landscape has failed us. A photograph provides a solution—a frame. The edge of print paper, the shift from light to dark, makes a border. The photograph acts as a window to help us imagine what we cannot otherwise see, even by the most careful looking. It does so by controlling our perception while encouraging the brain to construct what lies just beyond the edge of the photograph. Now the brain is back in control. 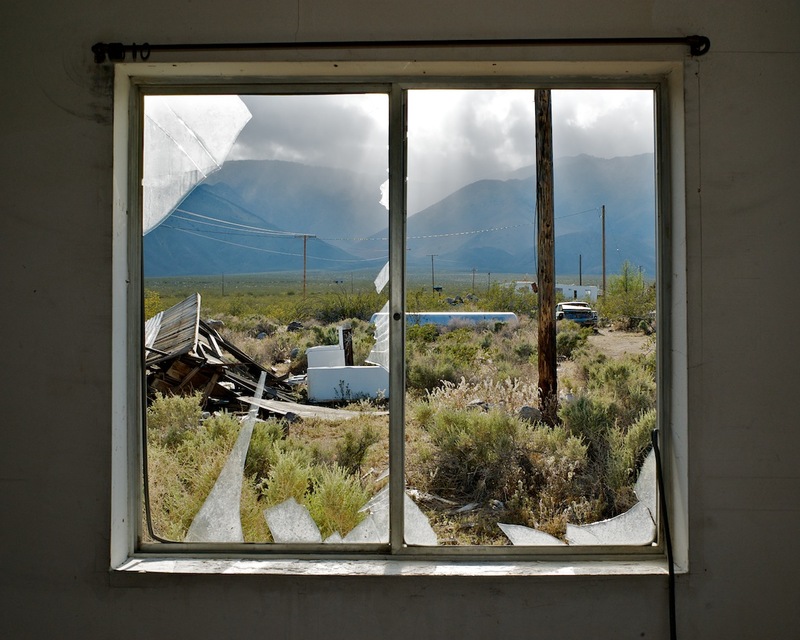 The images here, selected from photographer Osceola Refetoff’s desert windows series, invite the viewer to look out at the desert through the windows of abandoned, decaying buildings in the Mojave Desert. We can now see the desert landscape anew with less danger of cognitive wipe out. 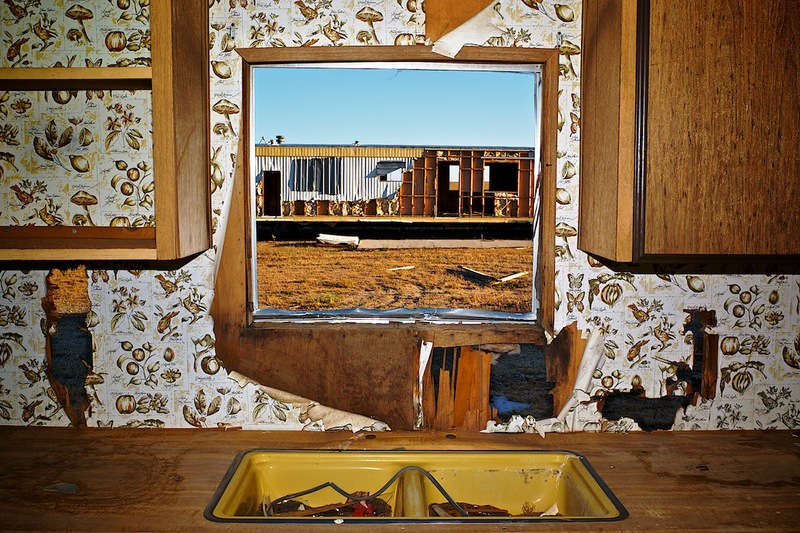 Consider “Desert Vista,” photographed through the weathered paneling of a trailer from a failed alfalfa farm north of Mojave, California. The photograph’s frame begins the process, but the window frame itself controls the observer’s experience of the flat plain that flows to the horizon and off to the left and right. The desert light shines in, illuminating the narrow molding of the window on the left and bottom. The depth of the view through perspective is thus reinforced. 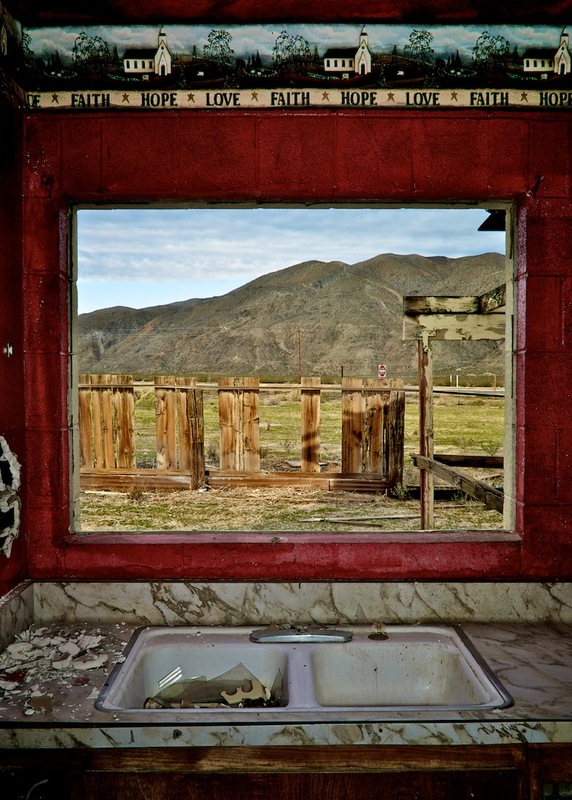 The window view is pristine, wasted and desolate. The image is flat to the point of appearing like a print pasted over the glass of the window. The depth of the horizon is difficult to determine. 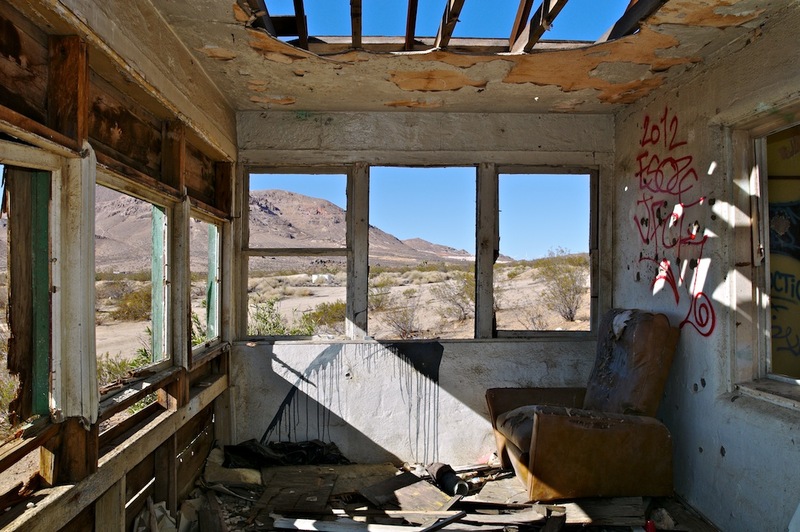 This kind of emptiness, particular in the Mojave, is only possible because of human intervention. The area was scraped and flattened to plant an alfalfa crop decades ago. Otherwise, it would be covered with creosote bush. The sky has no clouds for visual reference and produces the same effect as the land. We only see the sky growing paler as it moves to meet the horizon line. This image shows us much about the desert that might be otherwise lost in the brain’s struggle to make sense of what seems empty. Another two images, “Desert Kitchen” and “It’s a Mess without You!” show the same kitchen, photographed a year apart. In the first, the outside image of another trailer, torn by the wind and vandalized by passersby, is seen. It looks like it could be a mirror image of where the photographer’s camera has been placed. In the kitchen, things are not all right. The light is unromantic, and one cabinet is doorless and empty, the other veiled by a wood front. The peeling wallpaper, the sink full of junk, and even the window frame are cheap in style and quality. 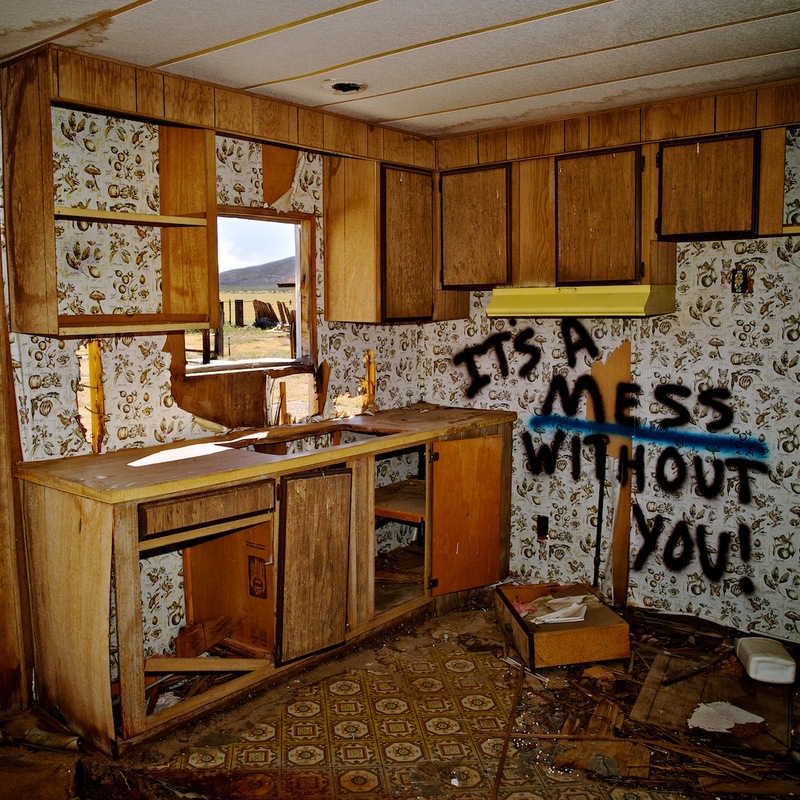 In the second photograph, we are in the same kitchen, but now the sink has been removed, perhaps to be recycled for some other kitchen, and the words “It’s a mess without you” are spray painted on the wall. This is more than a simple apology for bad housekeeping habits; the devastation is evident. These photographs in Refetoff’s desert window series are both ambiguous and a reflection on the loss of memory and the passage of time. They remind us that much of our culture and economy are transitory, unsustainable, and leave only wind-worn wastelands behind—and now even the trailers are gone, wiped from the land to make way for the Beacon Solar Energy Project off Highway 14 north of Mojave, California. In “Love, Faith, Hope,” the window has a rust red frame. There is a view of a decayed wooden fence and a dried, short-grass-covered desert flatland with barren hills beyond. 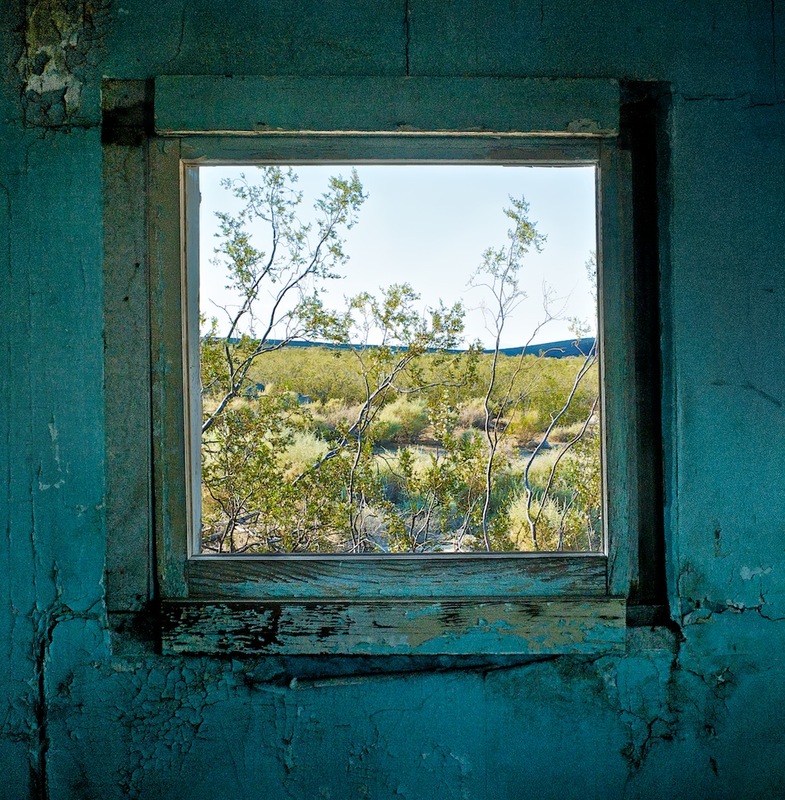 Refetoff builds up several layers of meaning: the inside of the view, the window and its frame, the outside view, and the high and dry desert beyond. But for Refetoff, the words over the frame feel somehow art directed. He wonders if the scene is an art project or perhaps the abandoned set of a film or music video. If true, this adds another layer of meaning, or at least ambiguity. The risk of cognitive dissonance remains: everything has been repurposed. Nothing is as it appears. The desert is always mutable. Today it is full of the modern ruins of failed human endeavor. The houses with windows wait. For what? The wind sets to work peeling, pushing, tearing. Then vandals join in, throwing rocks at the panes. The sun desiccates the cheap fiberboard, the flimsy shingles, the painted frames of wood. Visitors come to make scenes of these settings. The slow-motion process of decay keeps working away.